These Cream Coconut Caramel Pie Shooters are filled with fluffy cream cheese, whipped topping, caramel sauce, and toasted coconut! Make these ahead of time and wow your party guests! 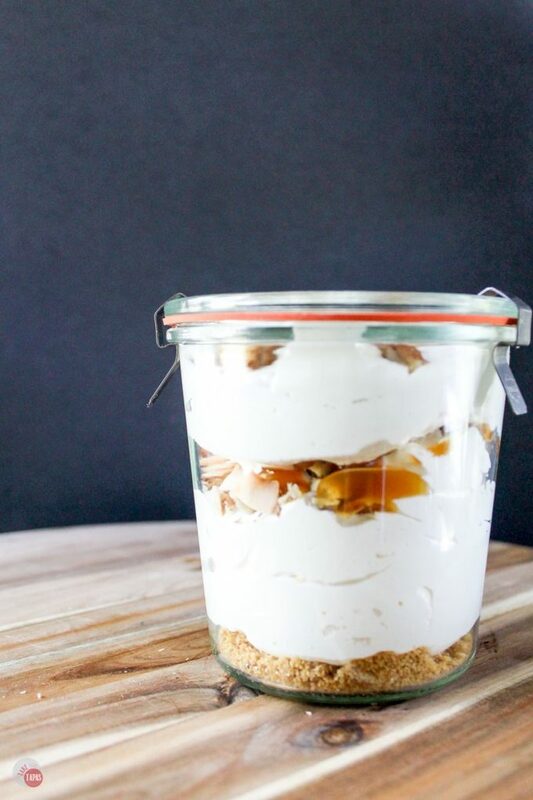 I’m about to give you a recipe with coconut and caramel that you are going to die over! 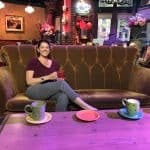 Just a few weeks ago I wrote a post about my adventures with the Kitchen Committee during Holy Week. Here is the link if you haven’t had the pleasure yet! During that week, over the course of 5 days, I consumed 2 whole coconut caramel pies. I was still abstaining from chocolate for Lent so that was just about the only dessert I could eat. So of course, I ATE AND ATE AND ATE! I asked the baker (Susan Welch) of the coconut caramel pie to send me the recipe so I could share it with all of you and you can eat till you are sick too! My real motive was to share it with you because it was easy, they can be made WAY in advance because they are stored in the freezer, and because one recipe makes 3 PIES! You can make one recipe and have 3 desserts to bring to dinner parties, or picnics, or just eat by yourself. Susan graciously mailed me (yes via snail mail) the recipe, so here it is! 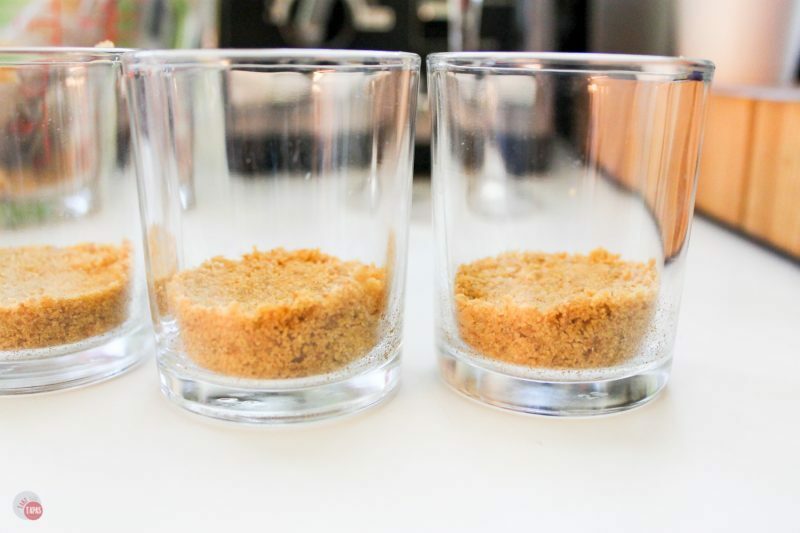 The recipe below shows how to make the crumbs for the shot glasses. If you want to make them into pies, just get 3 of the graham cracker pie crusts and layer the filling and the toppings like you do the shot glasses. I prefer to toast the crumbs and get a nuttier flavor and a little crispier crumble for the layers. I love this recipe because it is quick, delicious, and I have all the ingredients for the pies on hand. I use frozen whipped topping like Cool Whip or a generic version and you can make your own caramel sauce (here is a recipe for a great one). You can buy the bottle in the ice cream aisle without judgment. For a little extra crunch, I like to add nuts to my pies. You can use any mixed nuts you may have on hand, but I prefer my toasted pecans in this recipe and some toasted coconut chips. Dessert Shooters are trending for dessert now! 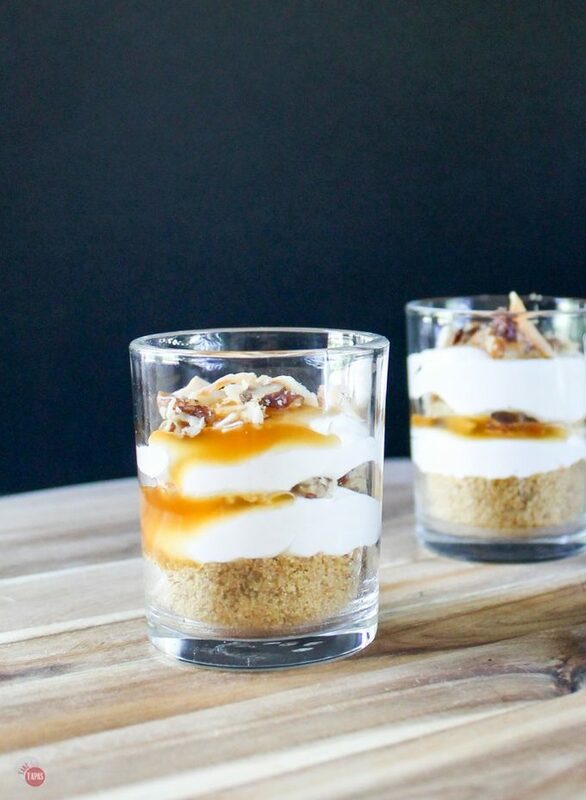 However you put these coconut caramel pie shooters together, they are sure to be a hit. I love that I can eat dessert and not walk away feeling so stuffed I have to undo my pants! 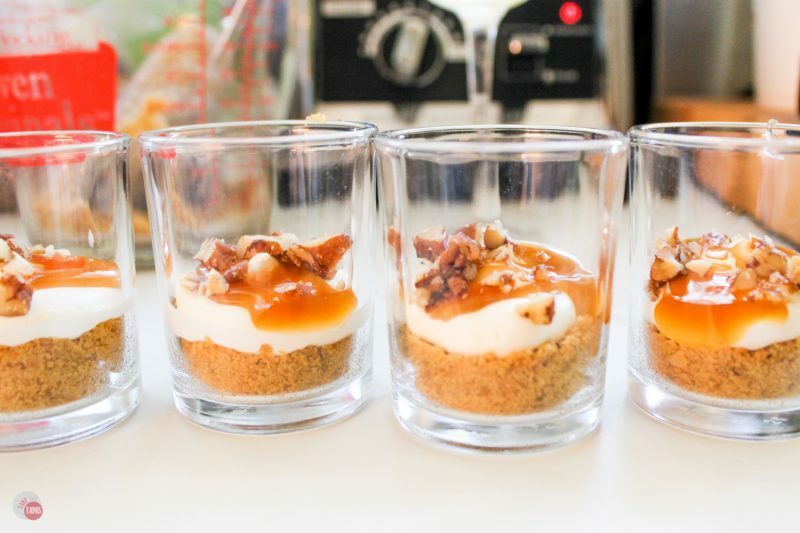 Some of my other small jar and shooter desserts include a Salted Caramel Nutella Shooter, a No Bake Coconut Key Lime Cheesecake Jar, my chocolate pumpkin shooters, and my Orange Sunrise Shooter. I can’t seem to get enough of these shooters so I am thinking about making these for Easter too! 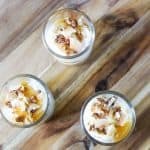 These coconut caramel pie dessert shooters are fun to make, great for kids to help with, perfect for birthday parties or showers! These fun pie shooters are a great alternative to a large dessert! Just the right portion to satisfy your sweet tooth without feeling guilty later! Combine graham cracker crumbs and melted butter. Combine cream cheese and condensed milk until fully mixed. Store in refrigerator until ready to assemble the shooters. If your mixture was in the fridge, let sit out for a few minutes to loosen it up. Put a tablespoon of toasted crumbs in bottom of the shot glass and press down to pack. Add a layer of cream cheese mixture. Sprinkle with coconut and pecans. Repeat with the layers until shot glasses are filled. Garnish with more coconut and pecans if wanted. Remove 10 minutes before serving. * I actually used tea light candle holders from the dollar store for these! They were slightly bigger than a traditional shot glass and cheaper! I love mini desserts and you have hit on my favorite flavor, coconut. BTW I could not load your page in Chrome. It did work in Safari. I always like quick dessert and in a glass is another favorite to make. yours looks wonderful ! This looks delicious! My girls would love making this with me! Thanks Krystal! I made a Key Lime one recently too! I think they are fun and easy to make and you can even make a bunch of the components in advance and assemble later! Thanks Danielle!I eat way too much dessert if I’m not limited in the size! We hardly have the time to make pies so we end up buying from our favorite bakery instead. It’s great to try out new recipes during the Holy Week when we get more time to spend with family. 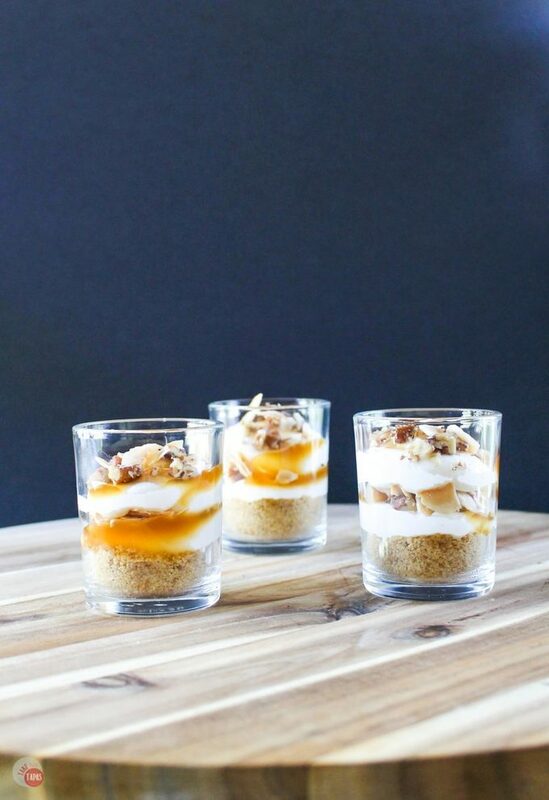 The creamy caramel coconut pie shooters look so delicious and creative! Thanks! Anything easy is the way to go! I am loving the use of graham crackers in this recipe. So much easier than a pie crust! I would love to make this recipe for summertime parties! I always have graham crackers on hand so it’s usually my go to. Plus it takes a lot less time than the traditional pie crust and you can make a bunch and freeze for later desserts! Like the pecans! Thanks Chrisy! I hope you enjoy! These shooters are so incredibly cute! Since my hubby is lactose intolerant we don’t eat a ton of creamy foods, but we might have to make a “skip dessert” one day and indulge in these. They look perfect for entertaining, too! These sound delicious and look great in the glass! They would be a great dessert at a get together! I can only imagine the chocolate dessert you had to turn down while you were there but at least you had these to eat! It was excruciating not being able to eat the chocolate because that is everyone’s go to dessert for cakes, cookies, and brownies. Thank goodness for Susan Welch and her pies! I can’t wait to try this!! They look beautiful, and so delicious. I love how you used the tea light holders, that’s a genius idea! I’m going to do that, too. Pinned! Thanks Jacqui! I have a hard time finding just the “right” container so I love to go to unexpected sources. Plus they were super cheap and reusable! This looks really yummy. I love anything with caramel, unfortunately the family won’t join me with the coconut. I will have to make a batch of these knowing I get to enjoy them by myself. Thank you so much for sharing. Ahhh this seems like a delicious recipe. I’m greedy so I would prefer to just dump the shooters into a larger bowl and cuddle up with a television and a snuggly blanket. I love coconut just that much! These look fun! I bet I could even use coconut cream instead of sweetened condensed milk for even more coconut goodness. Thanks Barrett! They would be good with the coconut cream and it would help cut down on the sugar! Thanks Ashley! My kids always love to help with dessert. Have fun!